A beacon of hope in the gloom of an increasingly unfair and divided society, Ashford Place is a charity deeply embedded in the community of North West London. We provide practical solutions for people trapped in the interconnected web of homelessness, alcohol and substance abuse, while facilitating ground-breaking support to those struggling with mental health, dementia and age-related issues. With a 90% success rate, our fresh approach encourages peer to peer engagement, empowering clients to take the lead in reclaiming their lives and regaining their place in society. 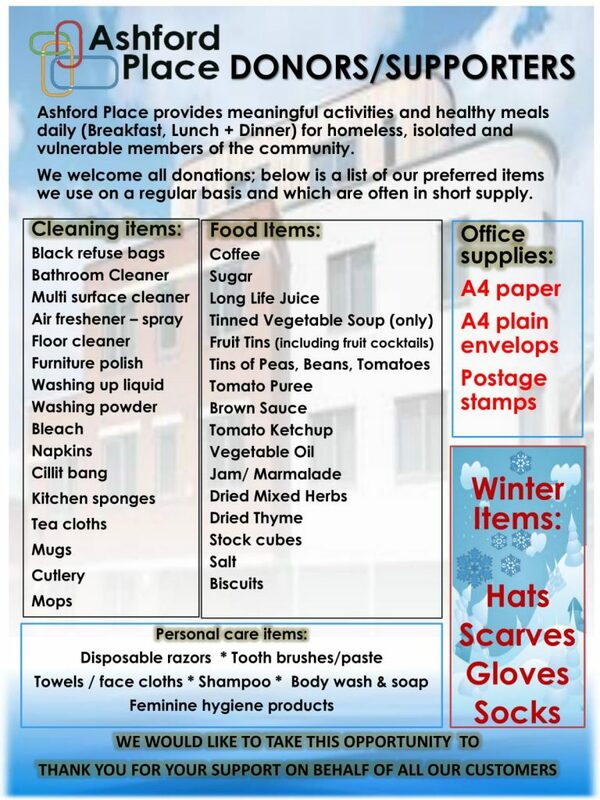 We need your help in providing essential supplies to the homeless, isolated and vulnerable members of our local community. Please contact Danny.Maher@ashfordplace.org.uk to find out how you can help.